Designed to safely organize and transport shooting gear while on the range, these top grade ballistic nylon covered Range Bags also provide excellent protection for all cameras, lenses, handguns, ammo and other gear. 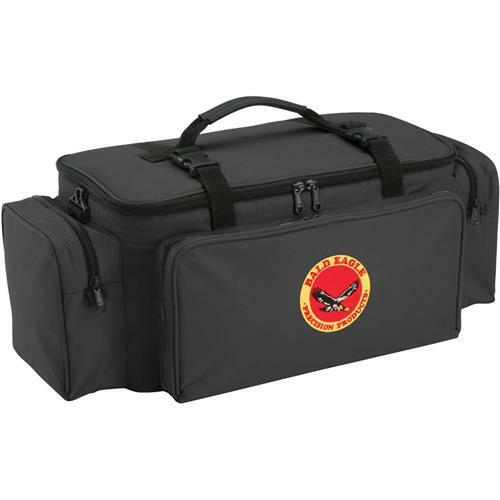 Padded protection throughout, adjustable padded dividers, double stitching, YKK zippers, adjustable shoulder strap and reinforced top handle provides all the security you need. Each features a top loading 15" long main compartment, two side compartments and a front compartment as well as a back zippered pocket. The overall dimensions measure 19-1/2"L x 9-1/2"W x 8"H.